In a medium saucepan melt butter over medium heat. Add onion and garlic and cook for 5 minutes until translucent. Add remaining ingredients to the saucepan and bring to a boil. Reduce heat and let simmer for 25-30 minutes. Stir occasionally. Pour the sauce into a blender and puree. Let cool to room temperature. Serve and enjoy! For more heat, add 2 to 3 additional chipotle chiles. This is great as a dip or perfect as a pulled pork sauce. Ericka Sanchez One thing I miss dearly from Texas is barbecue sauce. My favorite barbecue sauces are tangy and sweet with a hint of spice. I’ve learned to make my very own, sweetened with cherries and honey. For a full, spicy kick, I season chipotle chilies in adobo to give them that distinct barbecue flavor everyone loves. 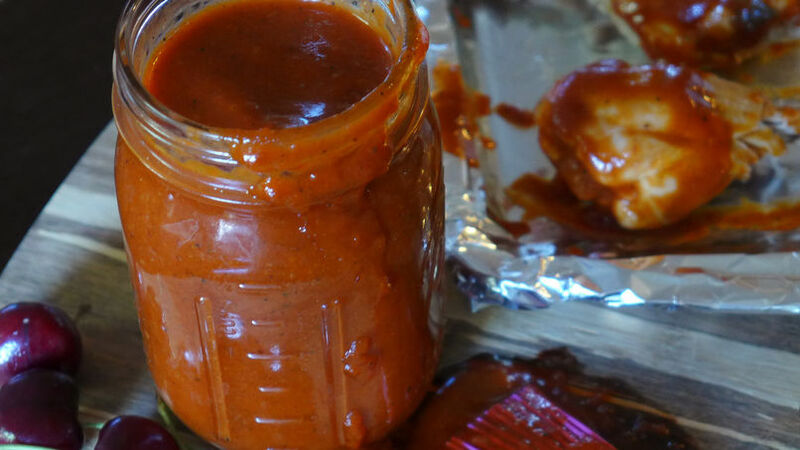 This sauce is great as a marinade or as a topping on your brisket or grilled chicken.